Home › MLS Rules › Are You Including Coming Soon’s in Auto Emails? Are Your Clients Seeing “Coming Soon” Listings? We introduced Coming Soon Listing Status this past November. This status in Matrix allows you to pre-market your listing through the MLS for a limited time until it is ready for showings. If you send your clients Auto-Emails in NorthstarMLS Matrix, they will not receive Coming Soon listings in their Client Portal unless you select that Status in your search criteria. You might want to update any Auto-Emails you created before November if you want to include Coming Soon’s. 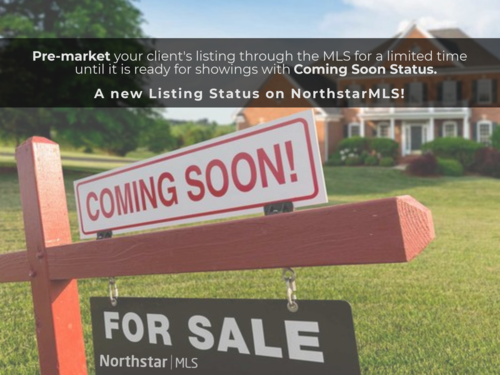 Since its release, over 600 listings entered in NorthstarMLS Matrix were listed as Coming Soon with an average length of seven days in the status before being moved to Active. You can also watch the quick video below to see how it works!